The leading training service provider of St Mark James training courses in Winnipeg is Winnipeg First Aid. It has been offering courses in Manitoba since 2009 and has excellent customer service, affordable prices, and highly competent instructors.Training courses are offered at different times throughout the week, including weekend and night classes. Trainees can sign up via e-mail, telephone, or walk-ins at the training center. An on-line application form is also available below. Various CPR level’s are available for registration including level’s “A”, “C” and “HCP”. 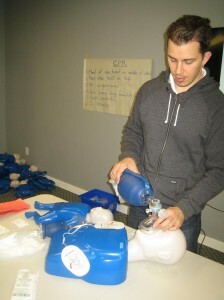 Find out what CPR course is right for you and register for a class using the on-line registration form on this page. Enrolment is also available using the contact information available on this site. You can contact Winnipeg First Aid using the information below. This training provider is located in Winnipeg and offers nearby amenities such as free parking, quick access to public transportation, and restaurants and shops within walking distance. What Courses Are Available with Winnipeg First Aid? Re-certifications are available for CPR level ‘C’ and ‘HCP’ certificates for individuals with current awards received from credible providers. 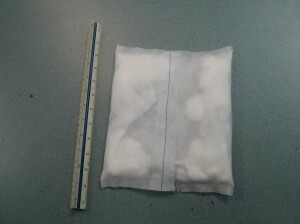 Drainage dressing used in skill training in first aid training classes. Winnipeg First aid offers the cheapest rates for St Mark James training courses, refresher courses, stand-alone classes, and private classes. Stand-alone CPR courses are only 54.99 dollars and standard first aid courses are only 114.99 dollars. All training course rates are inclusive of taxes, certificates, and St Mark James registration fees. Training manuals and equipment are also included in the initial enrolment fee. Refresher courses for renewal / re-certification of expiring certificates are offered at least twice a week at different training centres. Private classes are offered to trainees with scheduling problems and cannot enrol in any of the regular class schedules. Big groups or companies usually take separate training classes. Victims of chest injuries may or may not need a chest tube installed to drain air, blood, or fluid from the lung. There are different kinds of water-sealed drainage systems. Visit the Winnipeg First Aid website for additional information on classes and schedules. Enrol using the on-line application form above today!